Circles in the middle depict JCU as a meeting place. 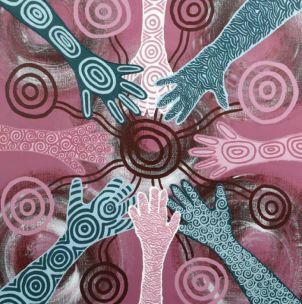 Outer circles are JCU's links to communities through its students, who return home to share their new knowledge and understandings. 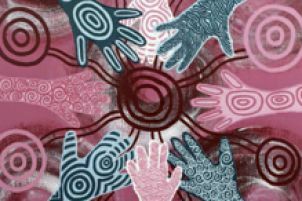 Different patterns within the hands and arms are the differences between and within Aboriginal, Torres Strait Islander, and multicultural Australia. There are also similarities in the hands and arms used to illustrate us standing together for equity and equality. 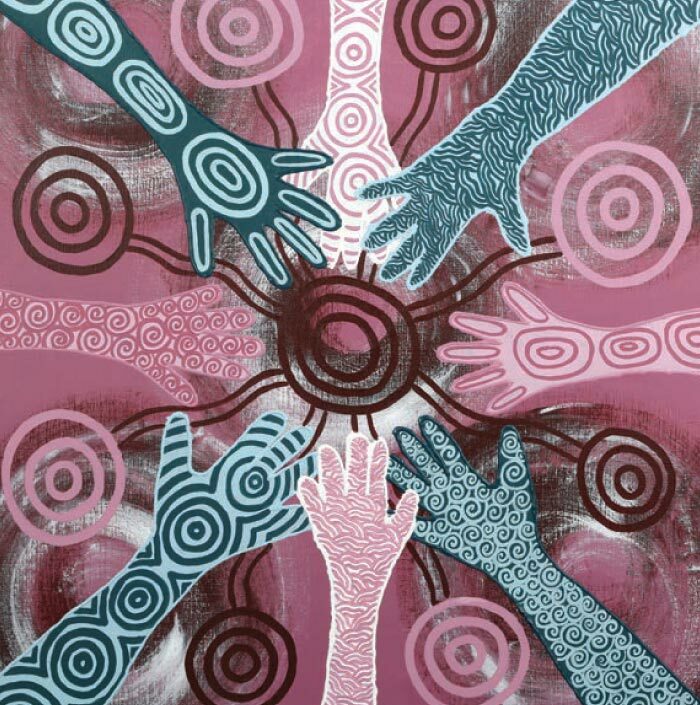 The ripple effect in the arms and hands represents out reconciliation journey; starting small, growing bigger, and reaching out to touch more and more lives. The effect gathers momentum to develop support and understandings. The circles represent the importance of yarning circles, meeting circles, and communities, in order that we can connect with each other. "My connection to JCU goes back over 25 years when I was a student studying to be an early childhood teacher. It was through a special entry program that targeted Aboriginal and Torres Strait Islander peoples, giving us the opportunity to study and graduate with the same qualifications as other students. This opportunity changed my life, and 25 years later, having taught in many communities, I am still teaching and making a difference in the lives of all children, especially our Aboriginal and Torres Strait Islander children. They need strong role models to encourage them to follow their dreams and to inspire them to do great things. I believe education plays and important role in shaping young children to be more accepting and tolerant of people from different cultures and backgrounds."